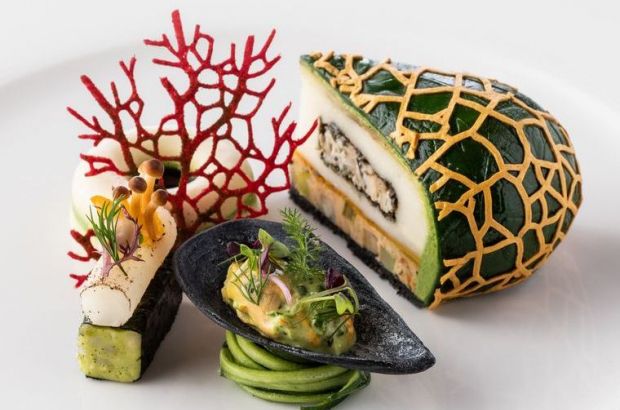 Belgium has finished eighth at the prestigious Bocuse d’Or culinary competition – known as the gastronomic Olympics – with the top three spots all taken by Nordic chefs. The team representing Belgium at the final in Lyon, France, comprised chef Lode De Roover of Fleur de Lin restaurant in Zele, East Flanders, 21-year-old sous-chef Piet Vande Casteele, and coach Jo Nelissen, who teaches at the renowned Spermalie hotel school in Bruges. The 24 competing teams from around the world had five-and-a-half hours to create a spectacular Chartreuse vegetable tart and roasted rack of veal. In the overall judging, Denmark took first place, followed by Sweden and Norway. Performing well at international contests such as the Bocuse d’Or is an important part of Flanders’ strategy to make a name for itself as a gastronomic destination, and the region’s tourism ministry has invested heavily in professional preparation for this and other competitions. Via Tourism Flanders, tourism minister Ben Weyts has invested €1.5 million each year since 2017 in the strategy. This has gone towards creating a professional framework, enlisting top coaches and establishing a training centre in Harelbeke, West Flanders. The biennial Bocuse d’Or was created by legendary French chef Paul Bocuse, who died a year ago. Belgium has won eight medals since the competition was first held in 1987, but their last time on the podium was in 1999 when Ferdy Debecker, now the chair of Bocuse d’Or Belgium, took bronze.